Delineate as “only great city of the world that started as a fantasy” Miami, with its awesome beaches, the subtropical climate has traditionally been heaven for the retirees and tourists. It is a place of many semblances. There are celebrity hotels, splashy malls, beautiful white sand beaches, turquoise water and much more. Joan Didion once said that this city is having a “kind of perilous attraction” Once you visit there, you will lose yourself here among the nostalgic Cubans, supermodels, and so many figures that live on the fringes. There are so many beautiful things to do in Miami which I am going to discuss in this article. When you cross the bridge of Miami beach, you will realize that there are a lot of things to do there plus it is the best beach near Miami. From various tourists hotspots to local spots, nighouts will spike your adrenaline to artworks and museums that will surely astound you. When a person thinks to visit Miami beach, the probability is that he/she is thinking about taking the sunbath on Beach and enjoy the lovely view of splashing water. Miami Beach is the best place where you can lie on the beach and the sun rays will soak your body. It is something you can say of a legend in the big Miami city. Here is a list of beaches in Miami, worthy places to visit and things to do in Miami Beaches. Sip the finest cocktail at radio bar, price bourbon, and seasonal craft cocktail. At WD555, try champagnes and fine pinot and also attend the weekly wine tasting. This restaurant has beautiful interior and sleek ambiance where you can sit and enjoy your glass of wine. Every Wednesday night, you can enjoy the local DJ and party there. At wet Willies, refresh yourself with some frozen daiquiris. At The Palace, drag queens and start the party early. It is the place where anyone, in fact, everyone goes for partying. At Mac’s Club Deuce, bloody marry or eye-opening Irish coffee. At Purdy Lounge grove out to some reggae. It is a low key dance club with some best DJs inside. Art and Entertainment in the city of Miami Beach. Listen to the new world symphony at New World Center and attend an audiovisual wall cast. At the historical landmark The Fillmore at Jackie Gleason Theatre, check out the comedy show and concert. Mingle with singles and rent some chairs at the 12th street beach. Experience the optional clothing at the famous beach of US that is Haulover beach. Gather your thoughts among the Japanese style landscaping blooming trees and red bridges at Miami Beach Botanical garden. Climb abroad a Miami Beach Duck Tour, if you really want to take insights of Miami Beach. Jungle Island is one of the attractions of the beautiful Miami city. Formerly this island is known as Parrot Jungle, and it is located on Watson Island. Jungle Island is only a few minutes away from the Downtown Miami and the South Beach. If you are on a long trip and get a chance to visit California, must check the famous food in San Francisco and you will definitely love it. Damn!! Jungle Island really attracts the tourists who are keenly interested in making adventures and discovering new things. When I visited there, I didn’t want to come back:). At the lakeside cafes there, I enjoyed the yummy meal for 8-10 dollars. These beautifully constructed buildings that give you a glimpse of the 1980’s have so much to offer you in the beautiful Miami city and it will surely take your breath away because same happened to me there. When you go out, these beautiful buildings will surely attract you to have a meal over there. In the dark, these buildings come in its own because of the canopy covered dining and the neon signs. This bayside marketplace offers you more than 150 specialty and tourists shops, restaurants and cafes. You will also find the lovely boutiques in their outdoor style and many chain store visiting tourists get attracted to the bayside marketplace. I can surely say that it is one of the best things to do in Miami if you really love shopping or even window shopping. It is known as one of the greatest treasures of Miami city. This is a worth visiting place because of its mindblowing architecture, artworks, and beautiful grounds. This guide to Miami will definitely help you to make your trip interesting. And the Renaissance style villa here is occupied with the exquisite European furniture, and the stunning artwork is from 15th to 19th century. To complete this 28-acre estate, more than 1,100 craftsmen were brought from Europe, and this is how this beautiful watermark of Miami is made and walking in the garden will give you a soothing effect and relax your mind and soul. Here in Miami zoo, you will get the sensation of exploring a real safari. Here animals are free to move like they are free from the walls of the cage and you will actually feel the real sensation of wildlife here. It is the biggest attraction especially for children because they love to visit the zoo and see the animals in reality that they use to see in their books. This place is famous enough for its cultural flavor. Little Havana offers great deals of fun and entertainment from the outdoor social places to the restaurants and variety of food corners. It is one of the nicest places to eat in Miami. 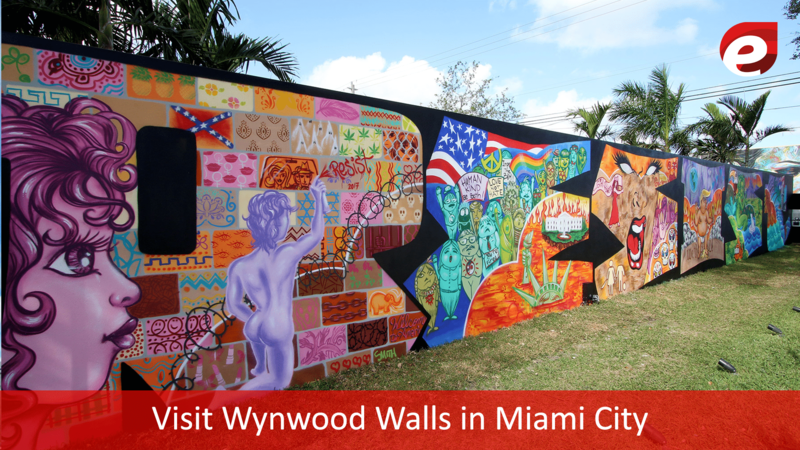 You will skip a breath in the cultural atmosphere where the nonstop Latin music is drifting through the air and the fascinating street art is adding flavor to the Little Havana. The district is spreading into the streets and avenues. Oh yeah, one last thing I forgot to tell you about little Havana is that Calle Ocho is known as the heart for setting the never-ending sun and activities over there. It is one of the nice places to visit in Miami. This freedom tower was built in the mid of 1920’s. It housed the Metropolis and Miami Daily News until 1950. Freedom tower hosted it because it was abandoned at that time. In the early 1950s, this beautiful building was overtaken by the government and they turned this building into the southern Ellis Island. It is open to visit for visitors from Tuesday to Saturday between 12pm to 5pm. This is the open-air museum. Wynwood walls are incredibly detailed, and this beautiful artwork blemishes the lie between the fine arts and street arts. There are lovely patterns on the walls that will make you forget the beautiful painting you have ever seen. World’s top artists have contributed to making this masterpiece. Many galleries have offer artwork for sale, but most of the visitors watch these lovely artworks and very few buys who have real craze to buy and can afford. This is a must visit place if you are bringing children along with you. It is located east to downtown Miami on Watson Island. When I visited Miami, I had 2 of my nieces with me there and they really enjoyed and gained a lot of knowledge there. Applause!!! this museum is ranked in top 10 largest children museum in the US. Visiting time for tourists is 10 am to 6 pm. Children without adults are not allowed to check in the museum. For children, visiting Miami’s Children Museum is one of the things to do in Miami. Design District is a posh area of Miami where you will find the high-end clothing, jewelry, and apparel stores. You don’t need to buy anything from there unless you are rich enough to afford these things. Here you can just walk by and watch them out. You will also find the art pieces and beautiful sculptures where you can stand with them take the photos. This park is located in North Miami. This is a small yet popular park, located in the nearby city of North Miami. This park has a beautiful collection of American artifacts, butterfly garden and animals and birds sanctuary. Visiting this park is one of the free things to do in Miami because there is no entry fee here. You can visit this park on Wednesday to Sunday from 9am to 5pm. Are you up to some world tour or planning some other trip to Corsica then we have 14 best things to do and see in Corsica, France. The American Airlines Arena is the main venue where the big concerts and best events of Miami take place. This hall can accommodate 19,000 people in it. This building was opened in 1999, and it has been awarded the Leed Green Building Certificate because of its super energy efficiency. 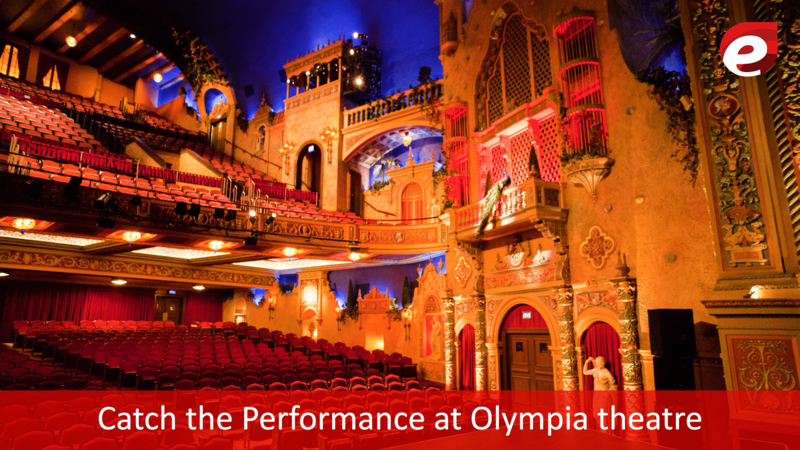 Olympia theatre is an iconic theatre of Miami city. This theatre has the wide range of concerts and events throughout the whole year. If you are in Miami then visiting this place could be one of the best things to do in Miami this weekend. This is the largest and the modern aquarium with the large marine animals including dolphins, sea lions, manatees and many more. It is located between the Key Biscayne and Downtown Miami on Virginia Key. It is the appropriate place to visit for the kids and adults as well. Visiting there is, of course, things to do in Miami. Tickets for adults worth $44.99 and for children it is $34.99. You will receive $2 discount if you buy a ticket online. It is a mile long beach, located in North of Miami. The shoreline is less built, that’s why the crowd is thinner in normal days. It is good to visit for few hours but this is not the good place for the extended stay. When to visit Miami and What to take there? Miami has the tropical monsoon climate with wet and dry seasons. The dry season lasts from late fall to mid spring. During the dry season, there is no measurable rainfall there. Even the rain shower and thunderstorm occur without any warning. It is better to keep an umbrella with you. The wet season runs from mid-spring to late fall. Peaking in late summer, hurricane season coincides with the wet season. Visitors who don’t want to ruin their visit must Miami in winters or early spring. Miami’s temperature doesn’t vary from month to month. However, winters tend to be manageable and milder. Summers are hot and tough but winters easy go in Miami. You must carry light and breathable clothes when you visit Miami. Cotton shirts canvas shoes, shorts, and sandals will all work in Miami. In Miami, the sun shines brighter here. If you have sensitive skin, then bring hat and sunblock with you. Also, pack raincoat and umbrella in your luggage for Miami. Either you are a swimmer or not, you should pack a swimsuit with you. 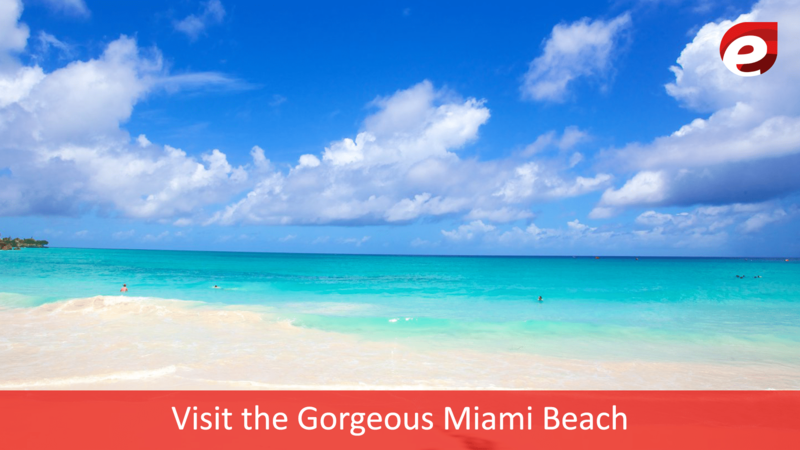 You may get a chance to stretch your legs and soak up sun rays on Miami Beach. Miami’s sun shines hot so it is better to keep a water bottle with you to protect yourself from getting dehydrated. You must carry a good amount of water in your purse or bag. Hope you have a good list of beaches in Miami now. If you are a hiker, then carry a large water bottle in your camel bag. This list of things to do in Miami will make your trip the best.